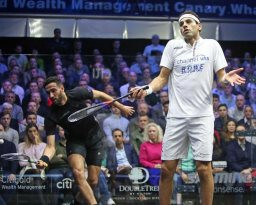 And it was another fellow countryman who divested the defending champion of another of his titles as third-seeded Tarek Momen earned victory in exactly an hour - 11-7, 6-11, 12-10, 11-9 in a re-run of last year's final in London. His opponent in tomorrow's final at East Wintergarden is set to be be fourth-seeded Paul Coll of New Zealand, who ended the inspired run of France's 32-year-old Mathieu Castagnet, not among the top eight seeds, who eventually lost his best-of-five games semi-final 12-10, 11-5, 11-6 in 47 minutes. Momen beat Elshorbagy in the World Championship semi-finals in Chicago at the end of last month before losing the final to Farag. During his earlier interview on court after his masterful quarter-final win, Elshorbagy had said: "This is going to be a test of character and I am going to challenge myself here and see. "It is hard when you lose the world number one ranking - it is not an easy thing to lose. "When you lose it because someone has raised their level over yours, you raise your hand up. "Ali, right now, is playing the best I have ever seen him play and right now he is the best player in the world. "I am going to be chasing him now." But so, on this evidence, is Momen, who had struggled to come through his last eight match against Australia's Ryan Cuskelly.